Atis has been a fixture of the Kalamazoo Civic Theatre stage for nearly 35 years. Approaching his directing work from the perspective of an actor, Atis holds a Master's Degree in Clinical Social Work as well as a BFA in Musical Theater, and brings his two decades of work in the mental health field to this production of The Father. In addition to his Civic repertoire, Atis has appeared in numerous shows throughout the community, most recently playing the role of Franz in Farmers Alley Theatre's The Producers. 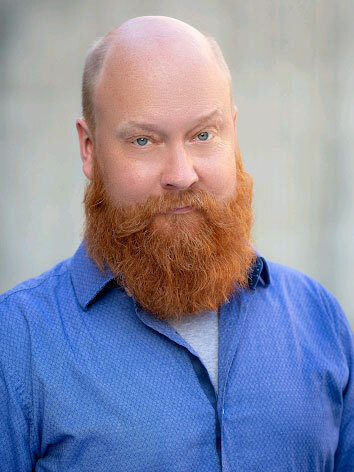 He has also been adjunct faculty at GVSU's Department of Theatre, where he played the role of Prospero in the 2017 Grand Valley Shakespeare Festival production of The Tempest. His favorite recent role was the 2016 Kalamazoo Civic production of Much Ado About Nothing in which he played Benedick opposite his wife Lisa's Beatrice. Other favorite roles at the Civic include such shows as The Taming of the Shrew, Dirty Rotten Scoundrels, Legally Blonde, Zombie Prom, Cyrano!, Camelot, 42nd Street, Guys and Dolls and Sweeney Todd. Productions with Farmers Alley include Beyond the Rainbow, Peter & the Starcatcher, Spamalot, Jane Eyre, Urinetown and Blood Brothers. As always, lots of love to Lisa for both encouraging me on this journey and then deciding to be part of it.